You’ll find “essential” daycare furniture like tables and chairs in every centre you visit. There’s also areas for the children to play and rest. 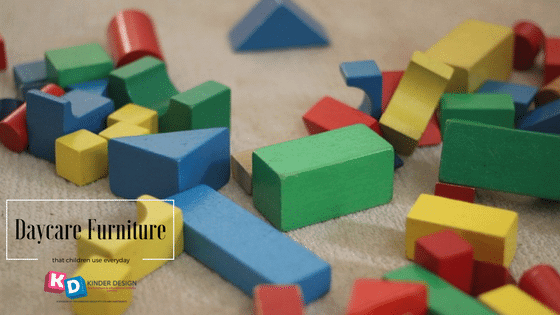 Other pieces of furniture mightn’t seem so important but they’re definitely something the children will play with and use constructively every day. Easels can come with whiteboard backing, magnetic backing or just as a wood frame with space to hold a canvas. Children use these to make works of art that get hung around the classroom or taken home to show off to parents. It’s healthy for kids to have a traditional creative outlet; they enjoy music, drama and active play. Normally they draw at a desk. But as a fun change getting some easels, a few paint pallets and lots of brushes encourages them to unleash their inner Picasso. For the builder or architect within. Building blocks are made and sold in large packs but there’s a multitude of options. Many daycares will have the traditional models made of wooden. Large, soft foam blocks, though, double as furniture. Large rectangular blocks can act as seats used in group activities or when children just want to sit together. Daycare furniture suppliers make the foam blocks in a range of colours to keep the item “playful” like the centre they’re going to. They also come in various shapes. It’s common for kids to make forts and houses out of the blocks. Kids copy what they see, and cubby houses give them an environment to act it out. Whether it’s an episode of their favourite reality cooking show or cartoon, there’s an option available to suit. Some daycare furniture suppliers can make cubbies to order. Cubbies get used every day because they so much fun to begin with. The children play house, or firemen or whatever other scenario the cubby allows. When cubbies are occupied, another option is for the children to use the foam blocks to make a house instead.